12 May 7pm-830pm. 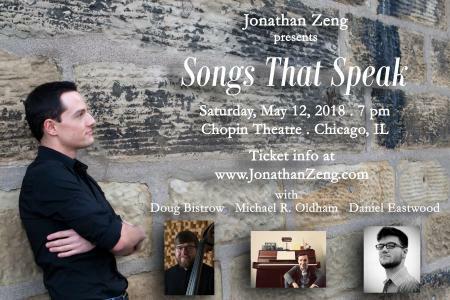 "Excellent tenor" Jonathan Zeng returns - thanks to the success of his recent, sold out debut cabaret performance- with his second SONGS THAT SPEAK! Lauded for his versatility as a performer, Jonathan performs throughout the United States in Musical Theatre, Opera, Oratorio, & Concert Repertoire. In SONGS THAT SPEAK, Jonathan performs some of his favorites from the worlds of musical theatre & popular music. Joined by pianist/composer Michael R. Oldham, percussionist Daniel Eastwood, and bassist Doug Bistrow, SONGS THAT SPEAK will take place in the fantastically eclectic Pregnant Buffalo Lounge at the Chopin Theatre.